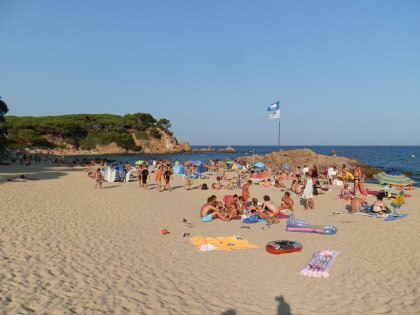 Sa Conca is a large sandy beach located between the port-marina of Platja d'Aro and S'Agaro that nestles below the luxury housing estates of S'Agaro. The estates are gated and there are no direct hotels nearby, which means that despite the size of Sa Conca's beach, it's relatively uncrowded and very unspoilt. The beach is broad and sandy with rocky areas at each side. The left side (looking out to sea) has a rockier bay and more fish. The main central part of the beach is sandier. As we were visiting in the evening, one thing we noticed is that it holds the sun for a long time as there are no cliffs or high rise buildings behind the beach. The beach has mostly houses at the back and a couple of chiriguitos (beach bars on the sand). There are lifeguards on station and the bay is marked out for swimming. When we were there there was a large blue swimming plaftorm of the type seen in Platja d'Aro in the main bay area. The back of the beach has a large car park which we didn't use so I'm not sure how it is accessed. The sand is coarse to gritty under foot and a little dusty away from the sea, though there is finer and softer sand at the two ends of the beach. The beach shelves gently at the left and right extremes and near the rocks making it suitable for younger children. In the main area it shelves more quickly, but not as rapidly as say Platja d'Aro main beach. The rockier area to the left has a mix of submerged rocks and a sandy bottom. It's easy to enter the water along a sand channel without hurting your feet, though you do need to be aware of where the rocks are close to the surface. There is parking at the back of the beach, but we're not sure where the access point is through S'Agaro. We parked higher up in the estate on one of the streets (for free) and walked down, or an alternative would be to park near the Port and walk across the final headland and down. The GR92 continues along past the beach and around the S'Agaro headland to Sant Pol.